As many analytics in the Cloud operate on datasets that can be potentially sensitive and private, allowing human data analysts to perform business analytics on raw data in the Cloud may lead to privacy breaches even if the datasets are anonymized through well-known anonymization techniques such as k-anonymization and differential privacy. In a cloud both data access needs to be private as well as data processing needs to be private no matter if the access is from an application running in the same Cloud or from a remote client device such as a mobile phone. When it comes to Mobile Cloud computing, one family of applications specifically raises concern. When mobile users in a Cloud request location dependent data services that require the locations of the clients for processing, a malicious adversary can utilize the location trace to invade the privacy of the user. MobiMix is a novel road-network mix-zone based framework for anonymizing location data and serving location based service requests without disclosing privacy in real-time. In contrast to spatial cloaking based location privacy protection, the MobiMix approach aims at breaking the continuity of location exposure through the development of attack resilient road network mix-zones. 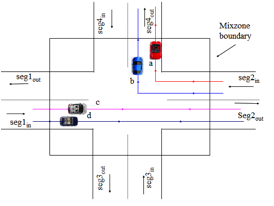 However unlike the theoretical mix-zones, in a road network the timing information of users' entry and exit into the mix-zone and the non-uniformity in the transitions taken at the road intersection provide valuable information to an attacker trying to break the anonymity. We developed a suite of mix-zone construction and deployment techniques that protect mobile users against location privacy risks by offering both timing attack resilience and transition attack resilience even when the mobility patterns and road-network topology are exposed to the attackers. 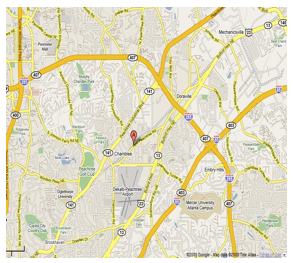 Continuous location based services represent queries that are continuously evaluated along the trajectory of a mobile user either periodically or aperiodically. 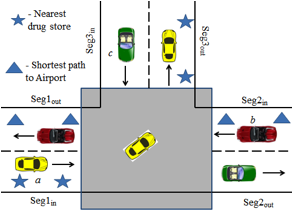 While MobiMix road network mix-zone approach works well against attacks based on road network characteristics, they are vulnerable to attacks based on the temporal, spatial and semantic correlations of location queries. 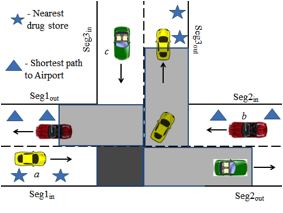 To protect continuous query users, We developed three types of delay-tolerant road network mix-zones (i.e., temporal, spatial and spatio-temporal) that are free from CQ-timing and CQ-transition attacks and in contrast to conventional mix-zones, perform a combination of both location mixing and identity mixing of spatially and temporally perturbed user locations to achieve stronger anonymity under the CQ-attack model. Based on experiments on large scale geographic maps, we find that by combining temporal and spatial delay-tolerant mix-zones, we can obtain the strongest anonymity for continuous queries while making acceptable tradeoff between anonymous query processing cost and temporal delay incurred in anonymous query processing. Overall, the delay-tolerant mix-zone approach provides higher level of anonymity while offering better quality of services for location based services with hard continuity constraints. Most existing privacy techniques protect the privacy of the individuals’ information while providing the utility of the anonymized data in terms of aggregate results. However, analytics on datasets providing accurate aggregate results may not protect the privacy under scenarios where the aggregate information by itself is sensitive, such as analytics related to business intelligence. 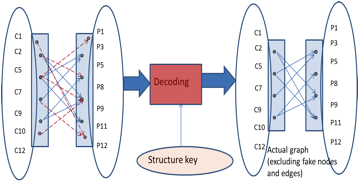 Our framework addresses this concern through the development of a new class of cryptographic anonymization schemes which deals with anonymizing graph datasets to protect utility at different levels such as graph structure, aggregate information and invidual associations. Thus, the techniques offer the ability to provide privacy controlled data utility customized based on per-customer access privilege levels. Thus, an important privacy enabling technology for cloud and outsourced data services is the ability to offer privacy controlled data utility customized based on per-user access privilege levels which cryptography driven anonymization schemes accomplish efficiently. The past few years have witnessed an increasing demand for the next generation health information networks, which hold the promise of supporting large-scale information sharing across a network formed by autonomous healthcare providers. One fundamental capability of such information network is to support efficient, privacy-preserving (for both users and providers) search over the distributed, access controlled healthcare documents. In this paper we focus on addressing the privacy concerns of content providers; that is, the search should not reveal the specific association between contents and providers (a.k.a. content privacy). We propose SS-PPI, a novel privacy-preserving index abstraction, which, in conjunction of distributed access control-enforced search protocols, provides theoretically guaranteed protection of content privacy. 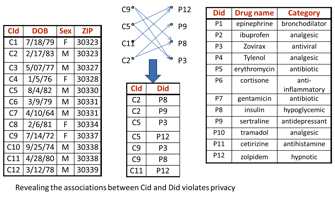 Compared with existing proposals (e.g., flipping privacy-preserving index), our solution highlights with a series of distinct features: (a) it incorporates access control policies in the privacy-preserving index, which improves both search efficiency and attack resilience; (b) it employs a fast index construction protocol via a novel use of the secrete-sharing scheme in a fully distributed manner (without trusted third party), requiring only constant (typically two) round of communication; (c) it provides information-theoretic security against colluding adversaries during index construction as well as query answering. We conduct both formal analysis and experimental evaluation of SS-PPI and show that it outperforms the state-of-the-art solutions in terms of both privacy protection and execution efficiency. · Mustaque Ahamad, Douglas Blough, Ling Liu, David Bauer, Apurva Mohan, Daisuke Mashima, Bhuvan Bamba, Balaji Palanisamy, Ramkumar Krishnan, Italo Dacosta, and Ketan Kalgaonkar, "MedVault: Health Professional Access to Source-Verifiable Patient-Centric PHR Repository", at poster session in 19th Usenix Security Symposium, (USENIX Security' 10).